There are many ways to stop foreclosure. Knowing how to stop foreclosures is a good skill to know in case a foreclosure becomes a reality. Can You Stop A Foreclosure Once Sale Date Is Set? You might be able to stop the foreclosure process in its tracks right up until the time that your house is auctioned. If your foreclosure is scheduled to occur in the next couple of days, you can still halt the sale. There are several ways that you can do that. One of the surest ways to stop a foreclosure is by filing bankruptcy. Once you file for bankruptcy, you will receive an automatic stay. It is a court order that prevents your mortgage lender from collecting on its debt. This order means that the bank cannot proceed with its plans to sell your home. To proceed with foreclosure once you file bankruptcy, a lender would have to petition the court to lift the automatic stay. This petition usually takes some time to file and be heard by the court. So, you would still have weeks or even months before the bank could foreclose. If you’ve fallen behind on your mortgage payments and the bank has sent you a Notice of Default, you might be worried that the bank might soon foreclose. However, even if the bank has started the foreclosure process, you still have options. One of your options is to file a loan modification, which is an agreement between you and your lender that allows you to change the terms of your loan agreement. A modification can lower monthly payments, making your mortgage more affordable. Once you file a loan modification, the foreclosure process will stop until the amendment is either approved or declined. You could also file a lawsuit to stop the foreclosure process. To win a lawsuit, you would need to prove to the court that the foreclosure should not take place either because the lender is wrongfully foreclosing or did not follow the proper procedure to foreclose in your state. Another option is to file for bankruptcy, which would immediately stop the foreclosure process as well. There are several choices for consumers when it comes to filing bankruptcy—Chapter 7 and Chapter 13. Both would immediately stop the foreclosure from continuing. The best type of bankruptcy for your case depends on many factors. It is best to consult with an attorney for more guidance. How Do You Get Out Of A Foreclosure? Losing a home in foreclosure can have many negative consequences aside from the loss of your home. It can damage your credit and result in a deficiency judgement—meaning that you could still owe the bank money after your home is auctioned off. Pay the delinquency – This can be a good option if you plan to get a lump sum of money soon, such as from a work bonus. If you can pay the mortgage arrears plus fees, the lender will often agree to stop the foreclosure process. Ask your lender for a workout option – Some lenders will agree to work out a plan with you to catch up your mortgage. These are sometimes called forbearance agreements. The best thing to do is to contact your lender to see what options they offer to help customers who are delinquent. Apply for a loan modification – You can apply for a loan modification to make your mortgage more affordable. This can be a good option if you are three months or more behind as you pay back the amount you owe over time. File bankruptcy – Even if a foreclosure sale is looming, a bankruptcy can keep your home from a foreclosure auction. 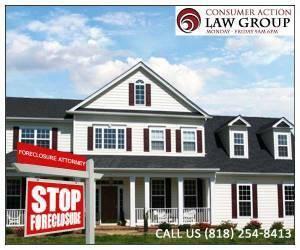 It is best to talk to an experienced foreclosure attorney for more information about bankruptcy. How Do You Stop A Foreclosure? Contact the mortgage company – If you are behind on your mortgage, call the mortgage company. When you call, explain your situation. Ask your lender what kind of workout options they offer. Most of the time, they can work out something that is mutually beneficial. Contact a Foreclosure Lawyer – If you cannot catch your mortgage up or have gotten nowhere with the mortgage company, the next step is to contact a foreclosure attorney. A foreclosure attorney is skilled at dealing with mortgage companies and can help you negotiate with them to save your home or help you find other solutions for your situation. Don’t Give Up – Maybe you have appealed to your mortgage company for help and gotten nowhere. They may not offer a solution that you can afford or maybe they have denied you for a loan modification. Whatever the case, don’t give up. Just because the mortgage company cannot help you, does not mean that you can’t save your home. There are still options. How Long Does It Take For A Bank To Foreclose On Your Home? Three months or more behind – A bank issues a Notice of Default. It is a notice telling you that you are violating the terms of your mortgage. This is the first step in the foreclosure process. Notice of Sale – If you still do not cure the default, the mortgage company will send you a notice of sale. This tells you the date that the foreclosure will take place. Foreclosure Sale – Finally, your home will be sold at an auction. Even if your bank has issued a Notice of Sale, you can still halt the foreclosure process. However, it is best to seek the advice of an experienced foreclosure attorney for guidance. How To Stop Foreclosure Proceedings? Are you delinquent on your mortgage and unable to pay what you owe? If so, the bank might have sent you a Notice of Default, which is a formal notice indicating that you are in default. Providing you with this notice is the first step towards foreclosure. The good news is that many programs can help you keep your home. Should you find yourself facing foreclosure, there are a few things you can do to help you keep your home and hold off the foreclosure. Ask your mortgage company for help – Sometimes mortgage companies offer workout options for debtors that cannot pay their mortgage. These workout programs may lower your monthly payment or tack a payment or two on the end of your loan. There are a variety of options available. It is a good idea to talk to your mortgage lender to find out what is best for you. Challenge the foreclosure in court – You can file a lawsuit to fight a foreclosure if your bank made an error and is wrongly foreclosing on your property. Talk to a foreclosure attorney – If you are facing foreclosure, hiring a foreclosure lawyer can be a good idea. A lawyer can help you if you believe that the bank is wrongly foreclosing on your property. Foreclosure can move along quickly. In some states and situations, it can take as little as 27 days after a missed payment for a foreclosure. At other times, a foreclosure may stretch out for a year or more. Regardless of where you are in the foreclosure process, there are things you can do to stop it from happening. You can keep fighting to save your home right up until the sale takes place. One of the best ways to stop foreclosure immediately is to file bankruptcy. Once you file bankruptcy, all collection efforts immediately stop. So, the bank must stop foreclosure proceedings once you file. Even if the auction date is days away, you may still be able to save your home. The best course of action at this point is to contact an attorney to help you determine what the best course of action is for your particular situation.